At Jet Worldwide, we view parcels as a form of communication: International parcel delivery represents a physical connection in our increasingly connected virtual world. We help you build reliable cross border delivery solutions for your customers everywhere. 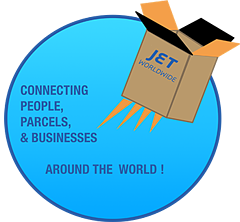 Jet Worldwide has been a trusted brand for over 30 years with an absolute dedication to our client's parcel and international logistics.